Non-toxic; safe around kids and pets. Some users report spray taking a while to take effect. Getting rid of bed bugs takes determination along with a really effective product. It can be a bit of a process, but it’s a necessary task; bed bugs are parasitic pests that will hide out in your bed laying eggs and biting you while you sleep. Harris uses natural ingredients in their bed bug-killing products that make them safe for everyday use while remaining effective. Approved by the Environmental Protection Agency, Harris’s Bed Bug Spray is a minimal risk insecticide that is safe to use around your loved ones and your pets. The active ingredients used are all-natural, meaning they are non-toxic to humans and won’t harm the environment. 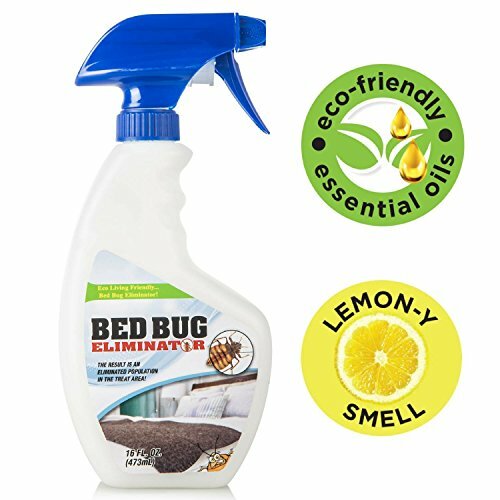 This natural spray is highly effective, killing bed bugs on contact while emitting a pleasant, light cedar scent. The residue left by the spray remains effective, acting as a deterrent and continuing to fight off bed bugs. Use this spray on your furniture, linens, mattresses, and other surfaces without the fear of staining. It is safe for everyday use and won’t force you out of your home like blasting, and other treatments will do. It is hard to find any fault at all in the Harris Bed Bug Spray. A simple-to-use product, this all-natural spray kills bed bugs on contact and continues to kill and protect the area long after. It has a nice scent and is non-toxic, giving users confidence that it’s safe to use in their home. Using only natural ingredients, the Harris Bed Bug Spray is safe to use in your home around children, pets, and loved ones. In fact, the natural ingredients are proven to be more effective than most synthetic ingredients. Since chemicals and fake products are used so much, insects have built up a tolerance to them, making natural products the best choice. Additionally, this product is EPA approved, so if their claims aren’t enough to convince you, they have this association’s stamp of approval. While this spray kills bugs fast, it continues to kill them long after your original application. 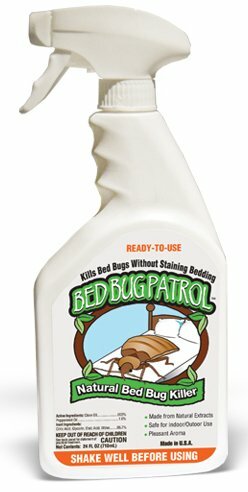 This bed bug spray instantly kills bed bugs when you spray this directly on them. This is excellent for the bed bugs that you see roaming around in your linens or around your bed, but the big feature here is the residual protection. While this spray kills bugs fast, it continues to kill them long after your original application. 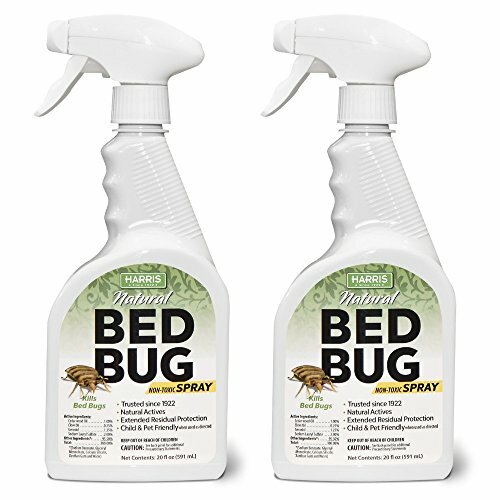 The spray will provide a sort of barrier that repels and kills any bed bugs that come close or in contact with it. This all-natural bed bug spray can be used on and around various surfaces in your home. Because of its formula, it is non-staining and won’t harm any of your furniture, linens, floors, or elsewhere. It also will not harm your mattress or box spring and can be sprayed directly on both of them. Unlike some bug sprays on the market that leave a harsh and foul odor, Harris Bed Bug Spray will not. In fact, this spray leaves a light cedar smell that most people enjoy. This is the kind of spray that doesn’t draw attention to itself. Its light scent is pleasant and won’t deter you from using it. The residual effect is lasting and creates a strong barrier. This product is one that has very little to complain about. It kills on contact, which is what most people are looking for in a bed bug spray. Its effective formula holds up to the company’s claims. The residual effect is lasting and creates a strong barrier. We found the cedar scent to be very nice and not at all harsh or overpowering. The cost is very affordable, which makes this an even more attractive product. Knowing that it is all-natural and non-toxic gives us peace of mind using it around homes. Known for its natural product, the Harris Gallon Jug Bed Bug Killer is an affordable solution for a large bed bug problem. Some problems take more product, and Harris has given us its same powerful formula in a larger quantity for a good price. The fact that this gallon jug comes with a spray nozzle makes it super convenient and easy to use. You get all the ease of a spray bottle with much more product. The only issue we found with this formula is that it may be irritating to some if it comes in contact with your skin. Use caution and always wash your hands after using.